As a developer on the vegan package for R, one of the most FAQs is how to customise ordination diagrams, usually to colour the sample points according to an external grouping variable. 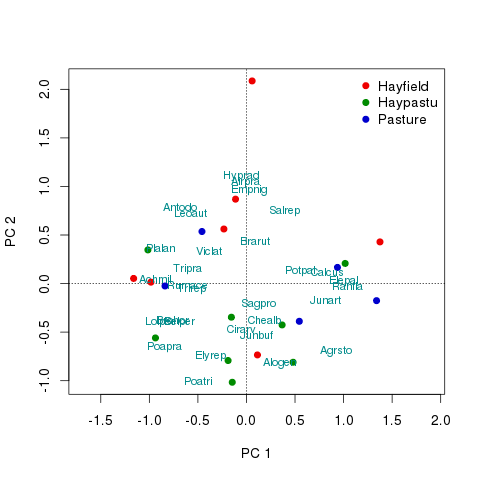 Now, just because we get asked how to do this a lot is not really a reflection on the quality of the plot() methods available in vegan. Ordination diagrams are difficult beasts to handle with plotting code without having an unwieldy number of arguments etc. There are potentially five sets of scores that need to be plotted so the number of arguments could quickly get out of hand if we allowed the user to pass all the relevant graphical parameters to the various sets of scores. We've provided a basic plot() method that is set up with useful defaults that works for all the ordination methods in vegan. This method is really there to allow the quick visualisation of the fitted ordination; I use vegan on almost a daily basis and none of my presentation or publication figures use the default plot method at all. However, we have provided all the tools needed to draw custom ordination plots within vegan. How you use them also provides a useful guide to building up base graphics plots from lower-level plotting functions. 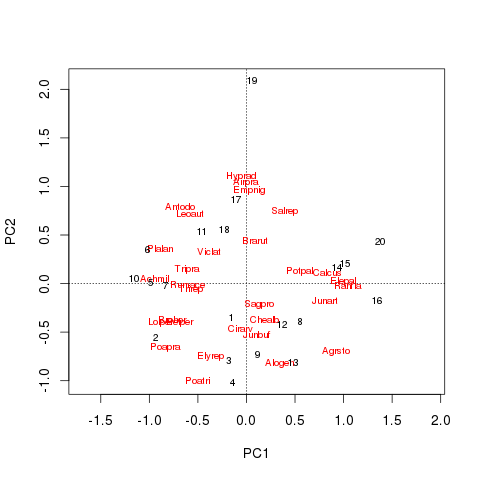 In this post I intend to show two examples of building up a simple PCA biplot from the basic building blocks available in vegan and R's base graphics. The next step is to add the site scores. Here I use the points() method rather than draw the site scores using their sample ID (as is the default in the plot() method). The display argument selects the type of scores to plot. The remainder of the arguments are the scaling for the scores (so they match the base plot) and arguments to style the plotted points. Next I add the species scores, but this time I want to label them with (abbreviated) species names. For this I use the text() method with argument display = "species"